The Waterkeeper Alliance and EWG analysis details how the swine and poultry industry, in the absence of smarter regulation, is not only repeating mistakes, but compounding them. 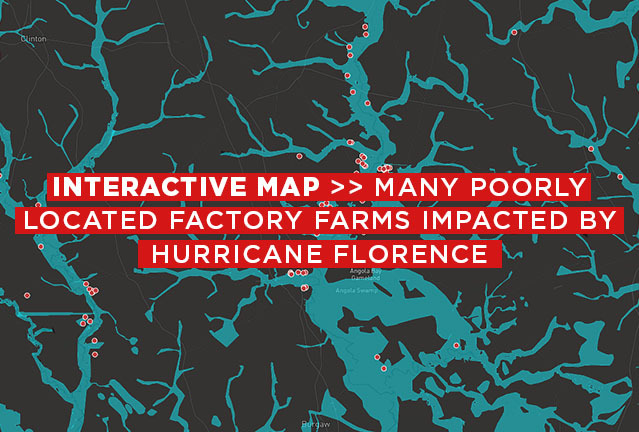 For instance, 18 of the industrial animal operations that were either surrounded or inundated by Florence floodwaters were also flooded by Hurricane Matthew in 2016. 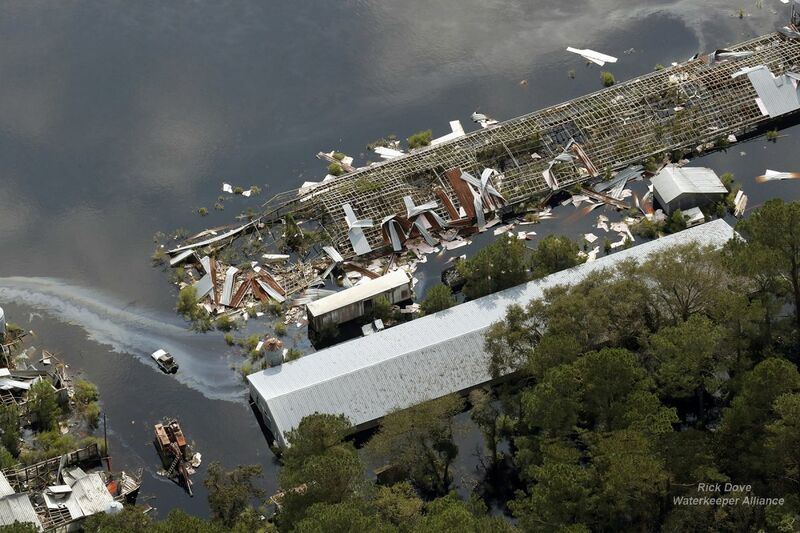 And of the 35 industrial poultry operations confirmed flooded, nine were new operations that had been built after Hurricane Matthew’s devastating floods. The new report, with interactive map, is an update to the Fields of Filth investigation the groups produced in June 2016. 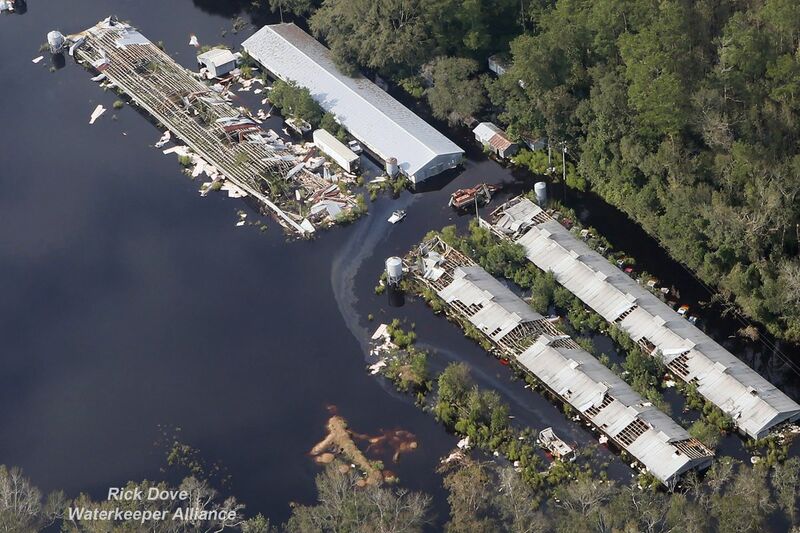 A November 2016 followup in the aftermath of Hurricane Matthew documented 36 swine and poultry operations hit by flooding. In the wake of past flooding, North Carolina implemented a permitting system for swine waste and funded a program to buy out facilities in the 100-year floodplain. But flooded poultry operations also pose a significant environmental threat, and are the state’s largest and fastest growing source of nutrient pollution, according to a 2017 report from North Carolina’s Department of Environmental Quality, or NCDEQ. North Carolina’s poultry industry produced 56.6 million pounds of nitrogen in 2014, according to the state’s report. That was three times as much nitrogen that year as the state’s swine industry, which is second in size nationally only to Iowa’s. North Carolina’s poultry produced 79.8 million pounds of phosphorus in that year, six times more phosphorus than the swine industry. The 35 poultry operations that flooded during Hurricane Florence generated an estimated 22,525 tons of waste a year alone, according to EWG. Along the Cape Fear River, four new poultry facilities were all flooded during Hurricane Florence. 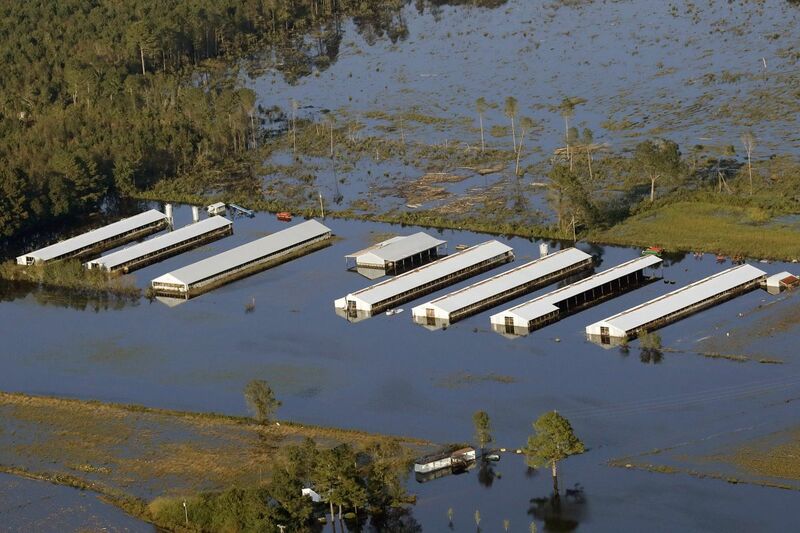 Yet these vulnerable operations are allowed to rebuild in locations with a well-documented susceptibility to repeat flooding because North Carolina’s poultry industry is largely unregulated. The vast majority of poultry operations in the state do not require a permit. Poultry waste, which is mixed with feathers and bedding to form “dry litter” and spread on fields, is kept in large piles, where rain can wash it into nearby rivers. One of the few regulations of this waste is that it must not be left uncovered for more than 15 days. But these minimal regulations are rarely enforced, as NCDEQ does not inspect poultry operations absent a complaint. 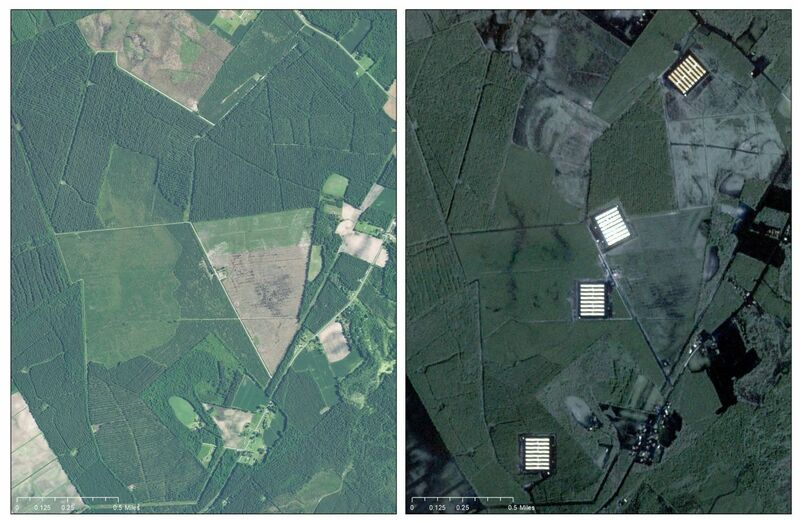 Soren Rundquist, director of spatial analysis at the Environmental Working Group, said that through his work examining satellite images and geotagged aerial photographs following Hurricane Florence, “I’ve already found hundreds of poultry operations that have been built in North Carolina since Hurricane Matthew hit. Despite the overwhelming evidence that allowing new facilities to be built will result in more flooding and more pollution, regulators are turning a blind eye to the problem." Of the 35 poultry operations the investigation found that either flooded or were surrounded by floodwaters threatening to wash away their waste piles, the majority, 21 operations, were outside the state’s 500-year floodplain (which itself has flooded three times since 1999’s Hurricane Floyd). “Regardless of what the designation is, when you’re getting 30 inches to 40 inches of rain, this area is prone to flooding,” Rundquist said. 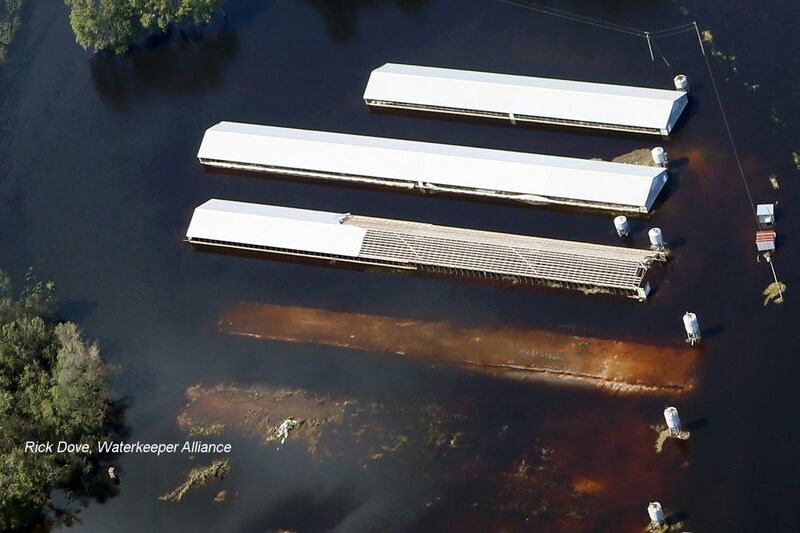 Waterkeeper Alliance and the Environmental Working Group used geotagged aerial photographs, high-resolution satellite imagery and a state database of hog operation locations to identify hog and poultry operations. It also used an investigation that Waterkeeper Alliance conducted in 2014, when it hired a data analyst to review satellite imagery to find the location and estimate the size of every industrial poultry operation in the state. The groups used an algorithm based on the state’s formula to estimate the number of animals the operations house. Their methodology is available here.